A few weeks ago, Google made its URL shortener, Goo.gl, open for everyone and gave it its own website, similar to Bit.ly’s. Previously, Goo.gl could only be used by Google’s own services. That’s something that we should test, isn’t it? So, for a couple of weeks after Goo.gl became open, we monitored its performance and reliability together with several other URL shortening services, including Bit.ly and TinyURL. We used, of course, our own website availability monitoring service (i.e. Pingdom). We were primarily concerned with the reliability and performance of shortened URLs. How much overhead do the different URL shorteners add, and do they always work? What you are ultimately comparing is the time it takes to go to a site directly versus the time it takes to go to that site via a URL shortener. Note that we only included “open” URL shorteners like Bit.ly and Goo.gl that let you create your own short URLs (just visit their site, enter a long URL, and get a short one back). There are lots of application-specific URL shorteners like Twitter’s t.co, WordPress.com’s wp.me, etc, that don’t let you do this. We didn’t include those since we wanted to test comparable services. Since we used the Pingdom monitoring network, the continuous tests were spread out over 25 locations distributed over North America and Europe. We performed tests every minute for 15 days. For those of you counting, that means that the numbers we’ll show you are the result of 21,600 tests per URL shortener. The overhead that an URL shortener adds is that, instead of going directly to a site, you first have to ask the servers of the URL shortening service where to go, and they will redirect you to the actual target site. As you’ll see, how much overhead this adds can vary a lot not just between different URL shorteners, but also between different geographical regions. To be perfectly clear, what you see in the chart here below is the extra time a URL shortener adds when accessing a site. We’ve sorted the list so that the fastest total average it at the top, the slowest at the bottom. Since people like to compare Goo.gl specifically with Bit.ly, it turns out that Goo.gl is almost 3x faster than Bit.ly overall, at least during the time period of this test. 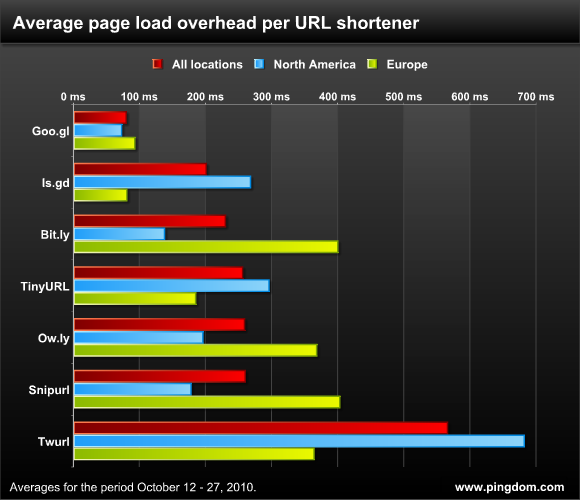 The really big difference, however, is outside North America, where Goo.gl is more than 4x faster. We attribute this to Google simply having more servers in more locations, which of course is to be expected considering how many data centers the company has. In North America the difference is less pronounced, where Goo.gl is 2x faster on average. The difference is less here because it’s where Bit.ly has its servers. The only place Goo.gl was beat was in Europe, where Is.gd actually managed to inch just ahead of it in terms of performance. That said, Goo.gl is still 2.5x faster than Is.gd in North America. It’s pretty safe to say that Is.gd has its servers in Europe. The most drastic difference in the test was between the European North American results for Goo.gl and Twurl, where the former was more than 9x faster. So there you have a worst-case scenario of how much the performance can differ between two services. It doesn’t matter how fast a URL shortener is if it’s broken. That’s why we thought it was relevant to also show the reliability of the included services here. Note that the “estimated downtime in a year” is based on just 15 days of monitoring, so it really is just an estimate based on the uptime of this limited time period. Both Bit.ly and Goo.gl delivered perfect availability, and Is.gd came awfully close. The 99.95% uptime shown by TinyURL and Ow.ly is also perfectly acceptable. After seeing these numbers, there can be no doubt that Google has indeed managed to create a very speedy URL shortener. It was by far the fastest service in this test. While important, it should be noted that speed isn’t necessarily everything. Many use URL shorteners for other features or reasons, so this report is by no means saying that Goo.gl is the best URL shortener out there, just that it’s the fastest of the ones we tested. Google has delivered on its promise. Goo.gl will add overhead just like any other URL shortener. It just adds a bit less thanks to Google’s ability to rely on its vast, distributed infrastructure. Nice to see Pingdom using its infrastructure for interesting and relevant research! @t-dub: Thanks. Good catch. Fixing it right away. I bet bit.ly handles a lot more traffic than goo.gl, so not sure how goo.gl will behave when it reaches the same traffic levels as bit.ly. goo.gl does not detect the duplicates, it generates a new short URL when you submit the same URL. However, bit.ly seems to generate same short URL when you submit the same long URL. I can see some use in deduping for analytic purpose, but it is subjective view point. It would be nice if twitter URL shortener t.co was included in the test. I have to give credit for Goo.gl’s tracking features BUT they really need to add Delete options(so you can Delete a link if you don’t need/want it anymore) and Custom URL options (Like what Tinyurl and Snipurl provide). Being able to Delete your links is a big one. It’s annoying how I have this history of links I don’t need anymore and have no option to Delete any of them. Especially when I don’t want people to access something anymore. For now I’m sticking with Snipurl.com because of it’s multitude of Customization options. If I want a QR Code I can use any of the free generators lying around the web. The only thing I’ll miss is the Powerful Tracking tools at Goo.gl’s disposal. I can deal with Snipurl.com going down a bit. I agree with Hari. The result is not so surprising as nobody uses goo.gl. Why do some people think that the number of users matter, I mean for some other, smaller shorteners it does. But for Google? Don’t think so, whether it gets 10 or 10 million visits, the speed’ll remain (as good as) the same. Expected Google would be the fastest. If they do it, they”ll do it best! Whow, and Google wins again. They got so much power, hope they use it wisely. I’d love to see you compare wp.me in there too, it’s a very common shortener for the WordPress community. Unlike Google, http://afil0.com url shortener gets its speed from simplicity and efficient coding. I’d love to see this test done again here in 2016, and have some of the newer URL shorteners like Rebrandly.com in the running. Web designers, keep those page sizes down. It's for your own good.